I didn’t really know much about Belem until I started researching my trip to Lisbon. 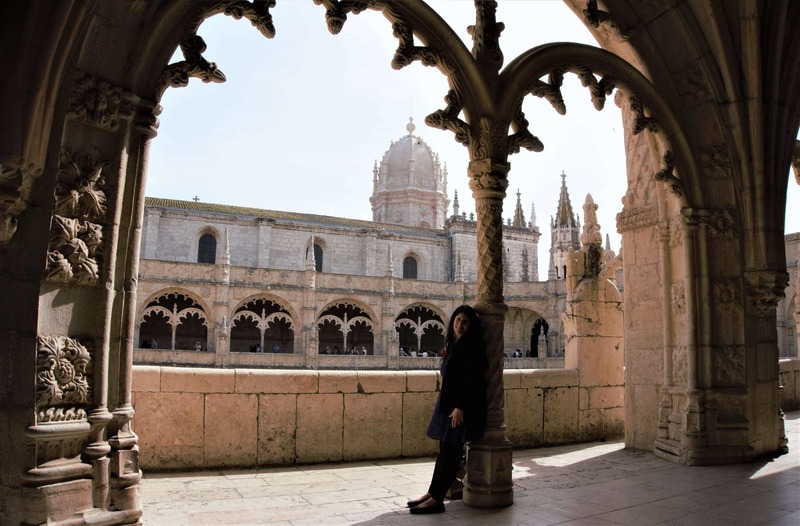 I knew that both Belem Tower and Jeronimos Monastery were UNESCO Heritage Sites, so I knew they were worth visiting. For some reason, I didn’t even think of buying tickets in advance. Big mistake! These sites are popular and for good reason, so you may want to consider buying a skip the line tour to avoid the long wait! There are actually quite a few interesting things to do in Belem. Let me tell you more about this Lisbon neighborhood and help you avoid some of the mistakes that I made. Note: This post contains affiliate links. Please see disclosure below for more details. Belem is such a pretty area of Lisbon! Whether you have 72 hours in Lisbon or significantly less, it’s worth visiting Belem. Several of Lisbon’s most beautiful monuments are located in Belem. It was nice that all the Belem attractions were within walking distance of each other. You can visit the sights on your own like we did or take a sightseeing tour. Click here to see Belem tour options. You can see this pastry shop is very popular. Our first stop was Pasteis de Belem to try the famous nata pastry (known more formally as pasteis de nata or pasteis de Belem). Pasteis de Belem invented the nata so it is a very popular place. If you like you can buy your Portuguese desserts at the counter for takeaway or you can get a table. Pastel de nata is a Portuguese egg tart pastry. Pasteis de Belem began making the original pastel de Belem in 1837! They use a secret recipe that came from Jeronimos Monastery. They still make the natas in their bakery by hand, using only traditional methods. We decided to eat at the Belem bakery and have a coffee as well. There was a crowd around the take away counter so we walked around that and followed the signs through a maze of rooms to get to the line for a table. It was a little intimidating but I was impressed at how fast the line moved. We waited less than 10 minutes. They are efficient and the place is huge, so don’t let the line scare you. We went to Belem on our first full day in Portugal so these were the first natas that we tried. After that we were hooked! We had a lot of delicious pastries, but both Russell and I agreed that the natas that we had at Pasteis de Belem were the best. So good that I forgot to take a photo, but you can check out a picture of one we had in Porto. We paid about 8€ for a couple natas and coffees. Belem Tower is about a 20 minutes walk from Jeronimos Monastery and Pasteis de Belem. It was a nice day so we didn’t mind walking, but you may want to consider taking an Uber. I could see the line before we even got to Belem Tower, but we didn’t have a choice. Luckily it was a little shorter than the line at Jeronimos. It was impressive to see how much the tide changed during the time we were waiting. 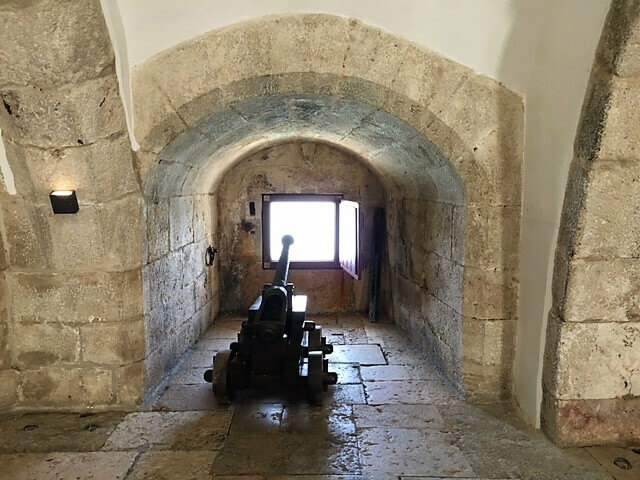 One of the cannons inside Belem Tower. View of the Tagus river from the top of Belem Tower. Belem Tower was built in 1515 as a fortress to guard Lisbon’s harbor and now has become the symbol of the city. When we got to the ticket counter we bought the combined ticket so we wouldn’t have to wait at Jeronimos Monastery, then we went inside. If you want just Tower of Belem tickets, they are 6€ per adult. The ground floor and basement were used for military storage and cannons, and there is a section that was a dungeon. It was fun to explore and a little spooky. Be careful, you may need to duck your head in some areas. There was a short line to go up the first flight of stairs, then we saw the line to go to the top. Lots of people were just sitting on the ground waiting. I knew this was not a good sign. They have to limit the number of people that go to the top of the Belem Tower in Lisbon because the staircase is narrow and there isn’t that much room up there. If stairs are an issue for you, I’m not sure it is worth it to visit as unfortunately there are no elevators. We waited about 30 minutes to go up the spiral 93 steps to the top. It was a beautiful day so the views from up high were fabulous and there are lots of spots for photos. The kid in you (or the ones you bring with you) will enjoy peeking inside all the nooks and crannies. Just be prepared for a bit of a wait. The view from the top of Belem Tower looking west. The Monument of Discoveries is right on the edge of the Tagus River. We actually discovered the Discoveries Monument (Padrão dos Descobrimentos in Portuguese) by accident. 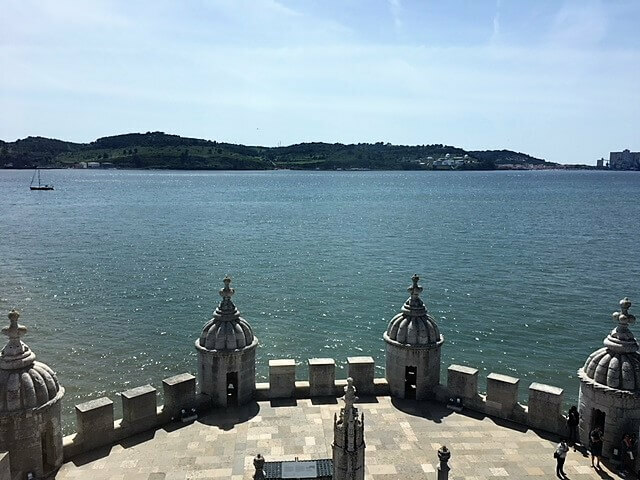 We were walking back from Belem Tower to Jeronimos Monastery and decided to walk along the water instead of the slightly faster way that google maps suggested and we spotted it. It is massive (171 feet tall) so we were curious to find out what it was about. Originally, the Discoveries Monument was meant to be a temporary structure for the World Fair in 1940, but in 1960 a permanent structure based on the original design was erected. It is fitting that the Monument is located in the Belem since that was an important place for so many discovery voyages. Vasco da Gama embarked on his voyage from Portugal to India in 1497 from here, and Christopher Columbus anchored in Belem on his way back to Spain following his discovery of the Americas. The Discoveries Monument really is a piece of art. The sculptures of the explorers on the monument are impressive. The largest one is Henry the Navigator, who was a Portuguese prince that play an important role in 15th-century Portuguese politics and is regarded as the main initiator of the Age of Discovery He sponsored many explorations including the one that discovered Madeira. There are 33 total statues on the monument, all representing key figures in the Age of Discovery. It is possible to go inside the Discoveries Monument, where you will find an auditorium, exhibition halls, and various other rooms. You can take an elevator to the top where there is a terrace where you can see panoramic views over Belem, the Tagus River and beyond. Unfortunately, since we were behind because of the wait to get our tickets, we just admired the monument from outside. You can read reviews of the Discoveries Monument on TripAdvisor here. From the Discoveries Monument, we went back to Jeronimos Monastery, which is across a very busy and wide road. Luckily, there is an underpass for pedestrians. Jeronimos Monastery is also a very impressive building. I love all the details and how clean it looks. Since we had purchased the combined ticket at Belem Tower, we already had our Belem monastery tickets and could walk right in. If you don’t have the combined ticket, the Jeronimos Monastery entrance fee is 10€ per adult. At some point though you should take time to admire the Jeronimos Monastery from the outside. It was built in the 16th century. The detail is impressive and the gardens were beautiful. I loved that the outside of the monastery looked clean and well maintained. Inside, we first visited the Cloisters. This courtyard is just gorgeous! The grass is perfectly green and the building itself is stunning. I have never been to a Cloisters with so many beautiful details. Be sure to peek into the confessionals and go upstairs for a better view. We walked around so that we could get pictures, trying to find the best sunlight. It’s not surprising to hear that the monastery took nearly 100 years to be completed. There is also an exhibit area in the Cloisters. When we went, we saw the exhibit on Alexandre Herculano. I really had not heard of Alexandre Herculano before. He was a “renowned thinker, historian, soldier, writer, polemicist, and journalist.” His political novels helped tell the story of Portugal’s history. He didn’t want any tributes or honors, but people wanted to preserve his legacy. They created the room inside Jeronimos Monastery to house his tomb. The view from the upper choir area looking into the church. 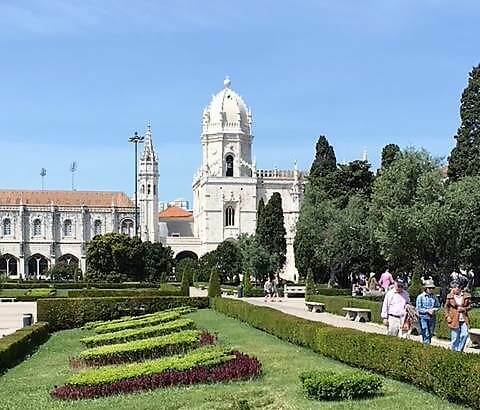 Lastly, we visited the Church of Santa Maria de Belém which is connected to Jeronimos Monastery. We were a little short on time so we saw the chapel from the upper choir area. On the ground floor level of the Belem church, you can find the ornate tombs of some important figures from Portugal’s history including King Manual I, Vasco da Gama (an explorer), and Luís de Camões (poet). You will need to think ahead on which ticket option makes sense for you. 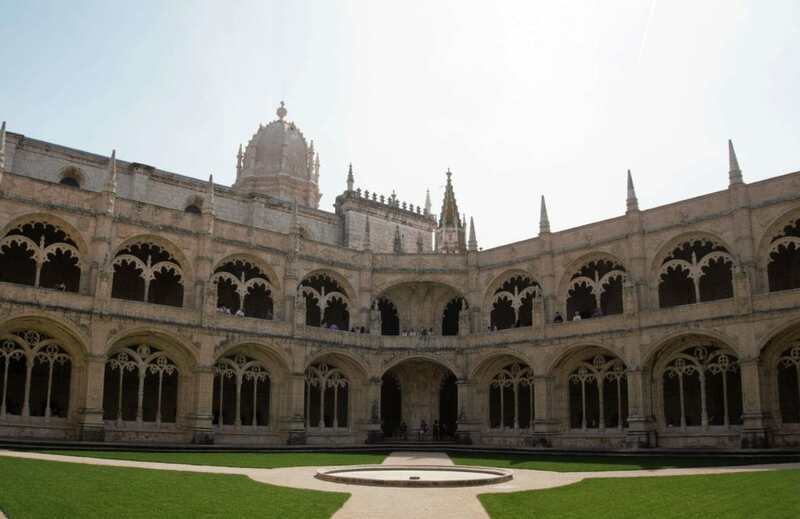 Unfortunately, you cannot buy Jeronimos Monastery or Belem Tower tickets online. It looks like their websites have not been updated as I tried the links and they were broken. Do you have time to wait for Belem tickets or would you rather pay more to skip the line? It may be worth a few extra dollars. The details inside the Cloisters of Jeronimos Monastery are impressive as well. When we went in early April, there was a pretty long line at both sites. We waited an hour at Belem Tour, which had a shorter line than Jeronimos Monastery. Then we bought the combined ticket (12€ per adult), so we could skip the line when we went to the monastery. Looking back, the paying a little more for fast-track access may have been a better option. The Lisboa Card includes public transportation, free entrance to some museums, and discounts at some shops. While both Belem Tower and Jeronimos Monastery are included, unfortunately, the Lisbon tourist card does not allow you to skip the line. You will need to think about how much sightseeing you will do in order to determine if the card is worth it. You can buy a Lisbon City Card for 24, 48, or 72 hours. The longer the timeframe the more you will save. Click here to find out more information on the Lisboa Card. 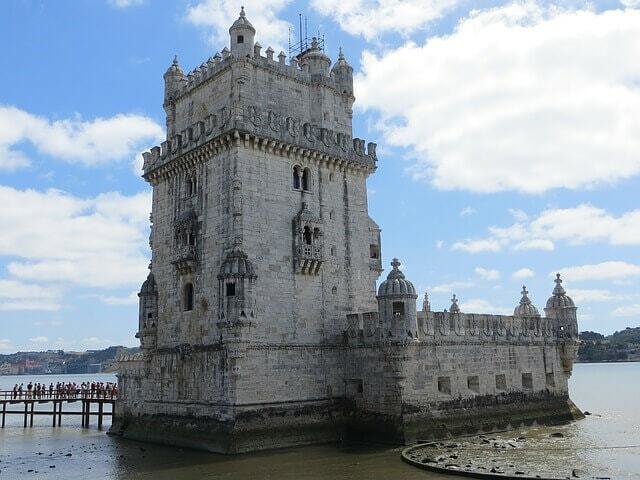 You could also purchase a Belem skip the line tour if you want to go inside Belem Tower and Jeronimos Monastery. This is the best option for those that are tight on time. Click here to check prices and availability for Belem Skip the Line tour. 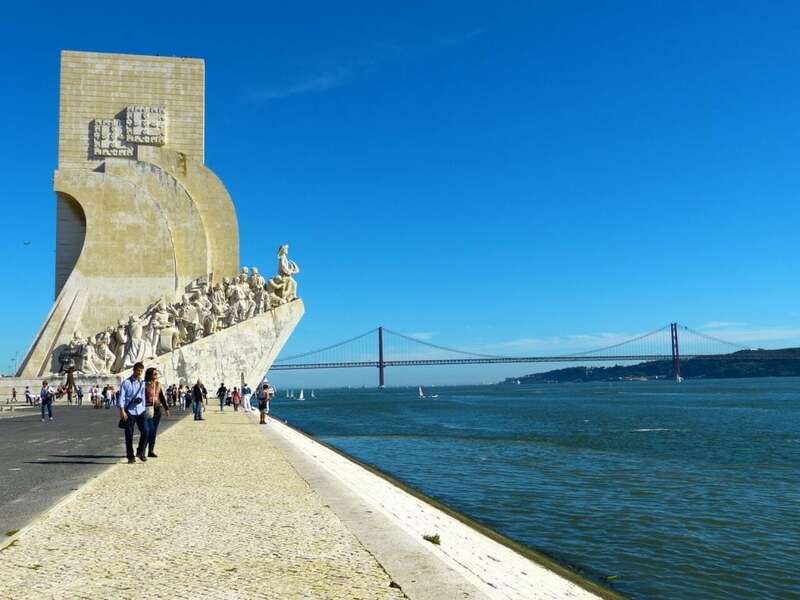 You could also consider doing another tour in the Belem district, but most are not going to include tickets to go inside Jeronimos Monastery or Belem Tower. A Belem boat tour to see the area from the river is another option, although again you would not be able to see the details inside. There are also bike and segway tours available in the area. Belem is located just 6.5 miles to the west of Lisbon. Since we were tight on time, we just took an Uber from Lisbon to Belem. I found Ubers to be very cheap in Portugal and was impressed that most of the Uber drivers we had spoke good English. 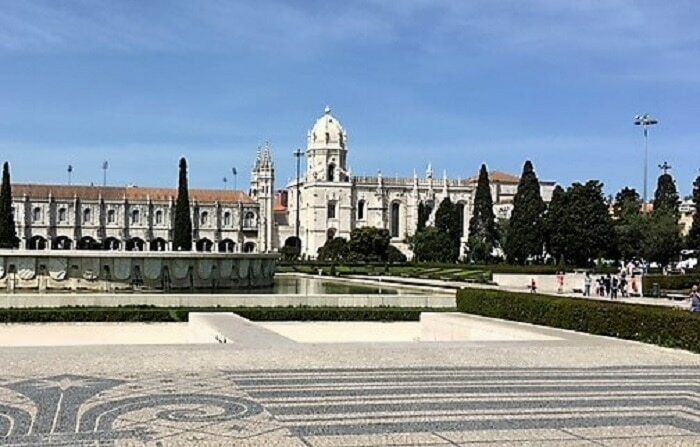 If you prefer to take public transportation to Belem from Lisbon, you can either take tram 15 or 127 from the Figueira Square (“Praça da Figueira” in Portuguese) or Comercio Square (“Praça do Comércio” in Portuguese) and get off it as soon as you pass Jeronimos Monastery. Just looking at the Belem Tower you can see why it is so popular. You can see a bit of the line to get into Belem Tower. There aren’t very many hotels in Belem because tourists usually prefer to stay in a Lisbon neighborhood that is more central. 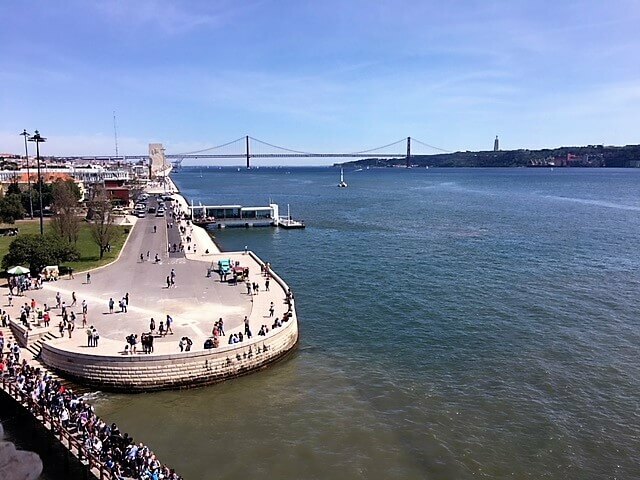 On the other hand, it could be nice to stay in Belem with lovely views of the Tagus River even if it is only for one night. The Atlis hotel looks fabulous and I love how they have the theme of discovery throughout the hotel. Click here to check reviews on Tripadvisor. Belem is definitely worth a visit during your time in Lisbon. The architecture is beautiful and you can get some nice views. You also have to try the original nata, I loved it. We also enjoyed both going inside both the Belem Tower and Jeronimos Monastery. Our Belem sightseeing took about 6 hours including about an hour wait to get into Belem Tower. You might want to add a little more time if you would like to go inside the Discoveries Monument. Have you visited the Belem district of Lisbon? Did you try the natas? I would love to hear what you thought in the comments. 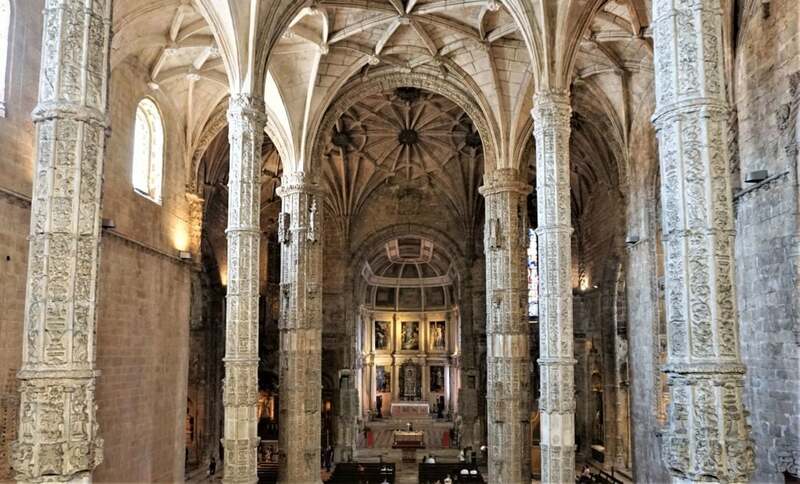 If you don’t want to wait for Jeronimos Monastery or Tower of Belem tickets, you may want to purchase a skip the line tour. You can use an Uber to travel from Lisbon to Belem or back from Belem to Lisbon. 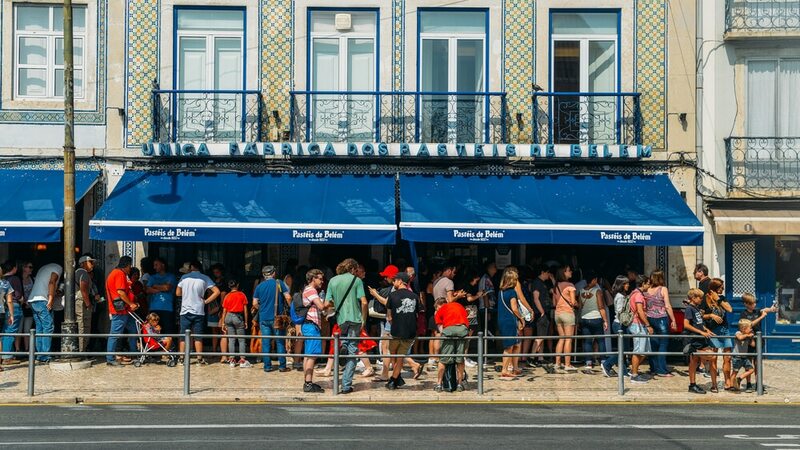 Don’t be intimidated by the line at Pasteis de Belem, you must try the original nata pastry. Use the underpass to go between the Discoveries Monument and Jeronimos Monastery. PreviousBest Gifts for Travel Enthusiasts Like Me! Hilary – Thank you, glad you enjoyed the post. We were really lucky with the weather. I don’t blame you for not going up Belem Tower, the line made me think twice for sure. Ladies, this sounds like a really fun thing to do! The pictures particularly make this appealing! I have not been to Lisbon et, but I am hoping to stop by there one day, and make a turn in Belem. Clem – Thank you. I hope you make it to Lisbon, it’s a beautiful city! More about it coming up on the blog so stay tuned! Belem is one of the things that makes Lisbon so special. We loved the cloister of the Monastery! Thanks for sharing your experience there. Yes, I loved Belem and the cloisters of the Monastery is a such a beautiful area. I visited Lisbon, and Belem, twice and I couldn’t believe how much crowdier it had gotten since the last time I visited. Going early in the morning, would definitely be my advice, as it is too precious to skip! Just a little outside of Belem is LX Factory, which is an old textile factory filled with artisan book shops, lots of street art and cafés. It was a great place! Esther – Good advice. I will have to check out LX Factory next time I am there. Thank you. Anna – Awe! You definitely need to go back. I was really impressed by the monastery and there are so many great spots for photos. I’ve been wanting to go to Lisbon for a while now, mostly to taste pastel de belem 🙂 Thanks for the great info. Razena – You won’t be disappointed! I hope you get to go soon. I’ve never been but interesting to read what is available there! Zoe – You should visit, it is a beautiful area. Thanks so glad to hear you like it. Thanks Sally. I hope you get the chance to visit. I spent half a day in Belem so didn’t really have time to go inside anywhere (other than the Belem pastries!) but I did walk around a lot and take plenty of photos. Definitely worth a visit when in Lisbon! Hannah – Glad you made some try for the pastries and yes it’s such a photogenic area. The Tower looks so stunningly intricate and I hardly need the excuse of a local delicacy to consume more carbs. Just one more reason to add Lisbon to the list. Yvette – Thank you! Yes you definitely need to visit Lisbon. I have more about my time there coming up on the blog. 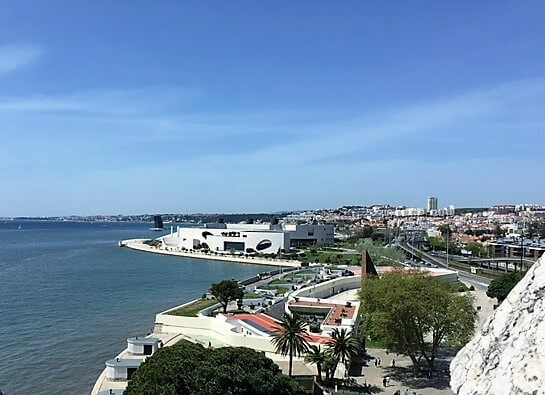 Laryssa – So glad you enjoyed the post and I hope you get to go back to Lisbon soon! Ruth – You will love Lisbon. We spent about half a day in Belem, it’s a beautiful area and we took tons of photos. Annabel – Yes the Monument of Discoveries is really impressive. 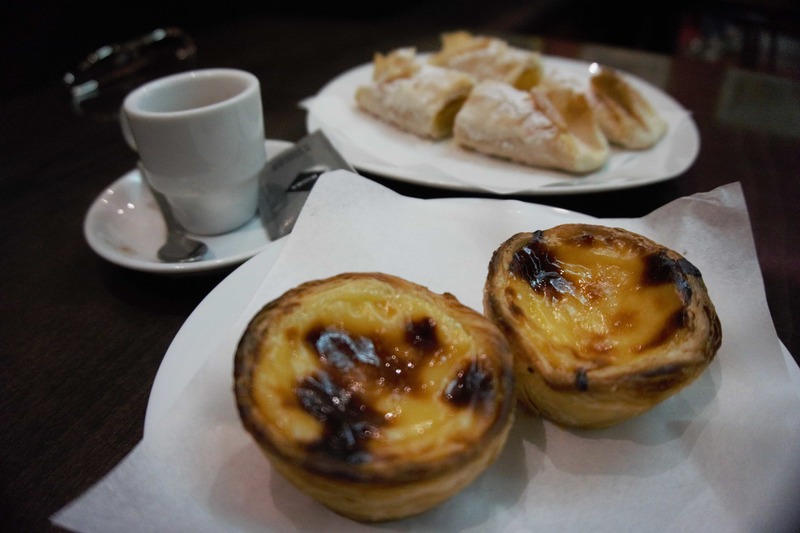 The desserts in Portugal are delicious, you really need to try the pastries from Belem. Are you planning a trip to Portugal? Want a printable version of our Portugal Itinerary to help you plan your vacation? Just enter your information below to claim your FREE Printable 1-Page Portugal Itinerary and join the Two Traveling Texans email community. We send out emails with travel tips and inspiration about once a week.